A number of members of Congress headed out to breweries this summer, but not to quietly enjoy a beer. While some sampled the product while there, the lawmakers for the most part used the sites as backdrops to criticize the trade war that President Donald Trump launched with his tariffs on aluminum and steel imports. American brewers fill and sell about 36 billion aluminum cans and bottles per year, according to a Beer Institute report. Brewers say tariffs will make it more expensive to package their products and they’ll have to raise prices for their customers. Lawmakers talked to workers about their concerns over how the trade war will hit them. “The folks at the brewery were very concerned about the tariff issues considering the amount of aluminum they utilize on a daily basis,” Virginia Sen. Tim Kaine said about a visit to Anheuser-Busch’s brewery in Williamsburg earlier this month. Kaine’s Virginia Democratic colleague, Sen. Mark Warner, visited Hardywood Park Craft Brewery in Richmond in June. “From what the brewers told me, this trade war is making cans a heck of a lot more expensive,” he said. Republican Sen. David Perdue told employees at Anheuser-Busch’s brewery in Cartersville, Georgia, on Aug. 3, “I do not favor a broad tariff like we’ve had on steel and aluminum. ... There are some benefits because you protect the producers of that, but you also cause price increases for the users of that product, and that’s an imbalance,” the Daily-Tribune reported. California Democratic Rep. Ted Lieu went to Lady Face Ale Co. on Aug. 4. His conversations about tariffs were focused on craft breweries. “Wisconsin breweries are an important part of Wisconsin’s heritage and economy. The President’s reckless trade policies are threatening an industry we are proud of, and throwing our state into the throes of his trade war. He needs to stop enacting trade policies that hurt Wisconsin businesses and jobs,” Kind said. Washington Democratic Rep. Suzan DelBene was at the Washington Breweries Festival in June to support the industry. 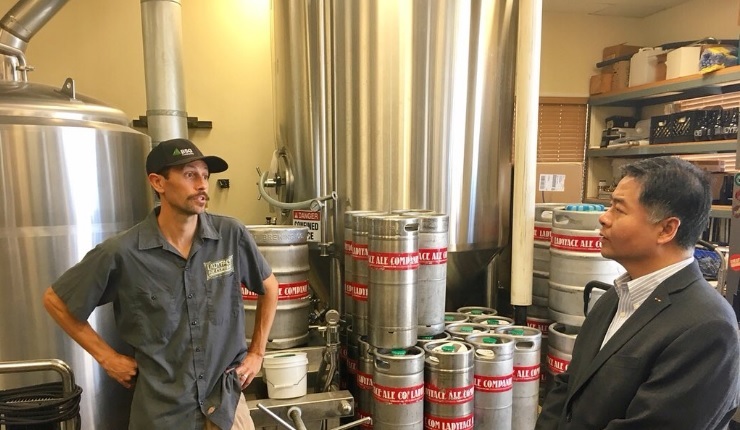 Colorado Democratic Rep. Diana DeGette visited Great Divide Brew in July and Alternation Brewing Company on Aug. 21. On his visit to Anheuser-Busch’s brewery in Williamsburg, Kaine got to sample a “freshly brewed Budweiser right off the line.” That’s what he prefers in everyday life, too. He said his go-to is a draft beer right from the tap. At Hardywood Park Craft Brewery in Richmond, Warner tried a pint of beer. “I went with the classic, a Richmond Lager. My staff informs me that the Virginia Pale Ale was good, too,” the senator said, adding that he prefers bottles to cans. Lieu couldn’t help but sample some of the brew while at Lady Face Ale Co.
“How could I not when my district has some of the best craft breweries in the country? I’m not a beer scientist, but I’m pretty sure my district&apos;s awesome water makes beer taste better. That’s not fake news, by the way,” he said. And, in Lieu fashion, he took a moment to take a stab at the administration. “I also want to note that unlike several Trump Cabinet officials, I’m not corrupt. No taxpayer funds were used to pay for the beer,” he said. He drank a City Brewery beer out of an aluminum can.